This DC to DC power converter input end is a male 5.5m male connector . Its output end is a USB type C connector with USB 3.1 Power Delivery (PD) function support. It can output 5V, 9V, 12V, 15V and 20V. With the reversible USB-C port and Power Delivery function, this charger can easily charge your new MacBook at full speed via USB-C to USB-C cable. Intelligently detects your device and delivers the optimal current to connected devices. Meets new energy efficiency requirements of DOE Level VI - the highest energy efficiency rating. Allows a single port to output different output voltages by negotiation between power source and powered device, such as 9V, or 12V, 15V or 20V. Output : USB Type C with Power Delivery, support 5V, 9V, 12V, 15V, 20V. *Special Note: This is just a DC power converter. It itself does not generate any power. To get 60W power output from this power converter, the input power source needs to be able to provide 65W or more power. This power adapter's maximum output is 60W. It will work with Macbook computers (or other computers) that have 90W+ original power adapters. A computer with 90W power adapter normally only needs 10W to 40W power to run. The extra power is mainly for charging the internal battery. If your computer's original power adapter is 90W or bigger, this power converter may charge the internal battery slower than the original, but otherwise it will perform the same. 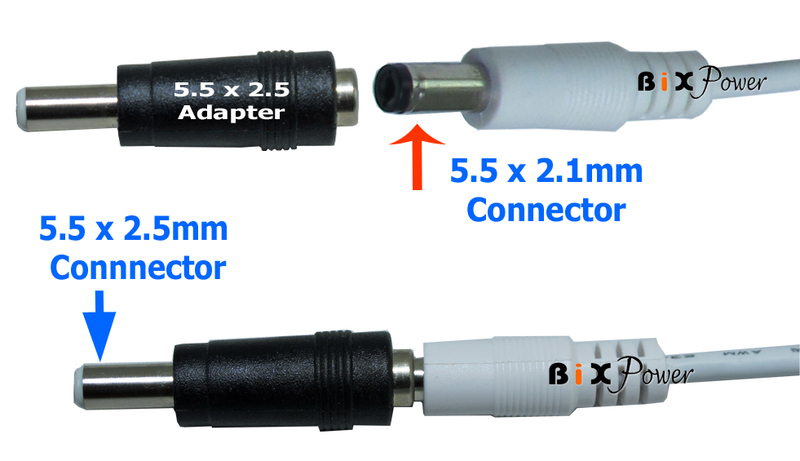 5.5 x 2.5mm adapter is optional, not comes with original power converter. It can plug over original 5.5 x 2.1mm input connector to form new size 5.5 x 2.5mm connector. If you plan to use this power converter with BiXPower batteries such as BiXPower BP90, BP100, BP160, AP170, BP220 batteries., you will need this 5.5 x 2.5mm adapter. Battery and 5.5x2.5mm adapter not included with PD60 standard package.